Liczba stron: 2954 Jest to ujednolicona liczba stron, która ułatwi Ci porównanie długości książek. Każda strona Legimi to 200 słów. 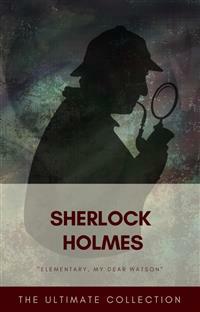 This ebook comprises almost all of Sherlock Holmes works by Arthur Conan Doyle:- The stories in their respective collections (The Adventures Of Sherlock Holmes, The Memoirs Of Sherlock Holmes, The Return Of Sherlock Holmes, His Last Bow).- The 4 Novels: A Study In Scarlet, The Sign Of The Four, The Hound Of The Baskervilles, The Valley Of The Fear. A Continuation Of The Reminiscences Of John Watson, M.D. - The stories in their respective collections (The Adventures Of Sherlock Holmes, The Memoirs Of Sherlock Holmes, The Return Of Sherlock Holmes, His Last Bow, The Case-Book Of Sherlock Holmes). - The 4 Novels: A Study In Scarlet, The Sign Of The Four, The Hound Of The Baskervilles, The Valley Of The Fear. Worn with pain, and weak from the prolonged hardships which I had undergone, I was removed, with a great train of wounded sufferers, to the base hospital at Peshawar. Here I rallied, and had already improved so far as to be able to walk about the wards, and even to bask a little upon the verandah, when I was struck down by enteric fever, that curse of our Indian possessions. For months my life was despaired of, and when at last I came to myself and became convalescent, I was so weak and emaciated that a medical board determined that not a day should be lost in sending me back to England. I was dispatched, accordingly, in the troopship Orontes, and landed a month later on Portsmouth jetty, with my health irretrievably ruined, but with permission from a paternal government to spend the next nine months in attempting to improve it. I had neither kith nor kin in England, and was therefore as free as air—or as free as an income of eleven shillings and sixpence a day will permit a man to be. Under such circumstances, I naturally gravitated to London, that great cesspool into which all the loungers and idlers of the Empire are irresistibly drained. There I stayed for some time at a private hotel in the Strand, leading a comfortless, meaningless existence, and spending such money as I had, considerably more freely than I ought. So alarming did the state of my finances become, that I soon realized that I must either leave the metropolis and rusticate somewhere in the country, or that I must make a complete alteration in my style of living. Choosing the latter alternative, I began by making up my mind to leave the hotel, and to take up my quarters in some less pretentious and less expensive domicile. On the very day that I had come to this conclusion, I was standing at the Criterion Bar, when some one tapped me on the shoulder, and turning round I recognized young Stamford, who had been a dresser under me at Bart's. The sight of a friendly face in the great wilderness of London is a pleasant thing indeed to a lonely man. In old days Stamford had never been a particular crony of mine, but now I hailed him with enthusiasm, and he, in his turn, appeared to be delighted to see me. In the exuberance of my joy, I asked him to lunch with me at the Holborn, and we started off together in a hansom. “Did you never ask him what he was going in for?” I asked. “Certainly,” I answered, and the conversation drifted away into other channels. “No. Heaven knows what the objects of his studies are. But here we are, and you must form your own impressions about him.” As he spoke, we turned down a narrow lane and passed through a small side-door, which opened into a wing of the great hospital. It was familiar ground to me, and I needed no guiding as we ascended the bleak stone staircase and made our way down the long corridor with its vista of whitewashed wall and dun-coloured doors. Near the further end a low arched passage branched away from it and led to the chemical laboratory. This was a lofty chamber, lined and littered with countless bottles. Broad, low tables were scattered about, which bristled with retorts, test-tubes, and little Bunsen lamps, with their blue flickering flames. There was only one student in the room, who was bending over a distant table absorbed in his work. At the sound of our steps he glanced round and sprang to his feet with a cry of pleasure. “I've found it! I've found it,” he shouted to my companion, running towards us with a test-tube in his hand. “I have found a re-agent which is precipitated by hœmoglobin, and by nothing else.” Had he discovered a gold mine, greater delight could not have shone upon his features. “How on earth did you know that?” I asked in astonishment. “Why, man, it is the most practical medico-legal discovery for years. Don't you see that it gives us an infallible test for blood stains. Come over here now!” He seized me by the coat-sleeve in his eagerness, and drew me over to the table at which he had been working. “Let us have some fresh blood,” he said, digging a long bodkin into his finger, and drawing off the resulting drop of blood in a chemical pipette. “Now, I add this small quantity of blood to a litre of water. You perceive that the resulting mixture has the appearance of pure water. The proportion of blood cannot be more than one in a million. I have no doubt, however, that we shall be able to obtain the characteristic reaction.” As he spoke, he threw into the vessel a few white crystals, and then added some drops of a transparent fluid. In an instant the contents assumed a dull mahogany colour, and a brownish dust was precipitated to the bottom of the glass jar. “Very interesting reading it might be made, too,” remarked Sherlock Holmes, sticking a small piece of plaster over the prick on his finger. “I have to be careful,” he continued, turning to me with a smile, “for I dabble with poisons a good deal.” He held out his hand as he spoke, and I noticed that it was all mottled over with similar pieces of plaster, and discoloured with strong acids. “I always smoke ‘ship's’ myself,” I answered. “Call for me here at noon to-morrow, and we'll go together and settle everything,” he answered. “All right—noon exactly,” said I, shaking his hand. “Good-bye,” I answered, and strolled on to my hotel, considerably interested in my new acquaintance. Knowledge of Literature.—Nil.Philosophy.—Nil.Astronomy.—Nil.Politics.—Feeble.Botany.—Variable. Well up in belladonna, opium, and poisons generally. Knows nothing of practical gardening.Geology.—Practical, but limited. Tells at a glance different soils from each other. After walks has shown me splashes upon his trousers, and told me by their colour and consistence in what part of London he had received them.Chemistry.—Profound.Anatomy.—Accurate, but unsystematic.Sensational Literature.—Immense. He appears to know every detail of every horror perpetrated in the century.Plays the violin well.Is an expert singlestick player, boxer, and swordsman.Has a good practical knowledge of British law. I see that I have alluded above to his powers upon the violin. These were very remarkable, but as eccentric as all his other accomplishments. That he could play pieces, and difficult pieces, I knew well, because at my request he has played me some of Mendelssohn's Lieder, and other favourites. When left to himself, however, he would seldom produce any music or attempt any recognized air. Leaning back in his arm-chair of an evening, he would close his eyes and scrape carelessly at the fiddle which was thrown across his knee. Sometimes the chords were sonorous and melancholy. Occasionally they were fantastic and cheerful. Clearly they reflected the thoughts which possessed him, but whether the music aided those thoughts, or whether the playing was simply the result of a whim or fancy was more than I could determine. I might have rebelled against these exasperating solos had it not been that he usually terminated them by playing in quick succession a whole series of my favourite airs as a slight compensation for the trial upon my patience. During the first week or so we had no callers, and I had begun to think that my companion was as friendless a man as I was myself. Presently, however, I found that he had many acquaintances, and those in the most different classes of society. There was one little sallow rat-faced, dark-eyed fellow who was introduced to me as Mr. Lestrade, and who came three or four times in a single week. One morning a young girl called, fashionably dressed, and stayed for half an hour or more. The same afternoon brought a grey-headed, seedy visitor, looking like a Jew pedlar, who appeared to me to be much excited, and who was closely followed by a slipshod elderly woman. On another occasion an old white-haired gentleman had an interview with my companion; and on another a railway porter in his velveteen uniform. When any of these nondescript individuals put in an appearance, Sherlock Holmes used to beg for the use of the sitting-room, and I would retire to my bed-room. He always apologized to me for putting me to this inconvenience. “I have to use this room as a place of business,” he said, “and these people are my clients.” Again I had an opportunity of asking him a point blank question, and again my delicacy prevented me from forcing another man to confide in me. I imagined at the time that he had some strong reason for not alluding to it, but he soon dispelled the idea by coming round to the subject of his own accord. It was upon the 4th of March, as I have good reason to remember, that I rose somewhat earlier than usual, and found that Sherlock Holmes had not yet finished his breakfast. The landlady had become so accustomed to my late habits that my place had not been laid nor my coffee prepared. With the unreasonable petulance of mankind I rang the bell and gave a curt intimation that I was ready. Then I picked up a magazine from the table and attempted to while away the time with it, while my companion munched silently at his toast. One of the articles had a pencil mark at the heading, and I naturally began to run my eye through it. Its somewhat ambitious title was “The Book of Life,” and it attempted to show how much an observant man might learn by an accurate and systematic examination of all that came in his way. It struck me as being a remarkable mixture of shrewdness and of absurdity. The reasoning was close and intense, but the deductions appeared to me to be far-fetched and exaggerated. The writer claimed by a momentary expression, a twitch of a muscle or a glance of an eye, to fathom a man's inmost thoughts. Deceit, according to him, was an impossibility in the case of one trained to observation and analysis. His conclusions were as infallible as so many propositions of Euclid. So startling would his results appear to the uninitiated that until they learned the processes by which he had arrived at them they might well consider him as a necromancer. I was still annoyed at his bumptious style of conversation. I thought it best to change the topic. “I wonder what that fellow is looking for?” I asked, pointing to a stalwart, plainly-dressed individual who was walking slowly down the other side of the street, looking anxiously at the numbers. He had a large blue envelope in his hand, and was evidently the bearer of a message. “You mean the retired sergeant of Marines,” said Sherlock Holmes. The thought had hardly passed through my mind when the man whom we were watching caught sight of the number on our door, and ran rapidly across the roadway. We heard a loud knock, a deep voice below, and heavy steps ascending the stair. “For Mr. Sherlock Holmes,” he said, stepping into the room and handing my friend the letter. He clicked his heels together, raised his hand in a salute, and was gone. I confess that I was considerably startled by this fresh proof of the practical nature of my companion's theories. My respect for his powers of analysis increased wondrously. There still remained some lurking suspicion in my mind, however, that the whole thing was a pre-arranged episode, intended to dazzle me, though what earthly object he could have in taking me in was past my comprehension. When I looked at him he had finished reading the note, and his eyes had assumed the vacant, lack-lustre expression which showed mental abstraction. “Commonplace,” said Holmes, though I thought from his expression that he was pleased at my evident surprise and admiration. “I said just now that there were no criminals. It appears that I am wrong—look at this!” He threw me over the note which the commissionaire had brought. “There has been a bad business during the night at 3, Lauriston Gardens, off the Brixton Road. Our man on the beat saw a light there about two in the morning, and as the house was an empty one, suspected that something was amiss. He found the door open, and in the front room, which is bare of furniture, discovered the body of a gentleman, well dressed, and having cards in his pocket bearing the name of ‘Enoch J. Drebber, Cleveland, Ohio, U.S.A.’ There had been no robbery, nor is there any evidence as to how the man met his death. There are marks of blood in the room, but there is no wound upon his person. We are at a loss as to how he came into the empty house; indeed, the whole affair is a puzzler. If you can come round to the house any time before twelve, you will find me there. I have left everything in statu quo until I hear from you. If you are unable to come I shall give you fuller details, and would esteem it a great kindness if you would favour me with your opinion. “Yes, if you have nothing better to do.” A minute later we were both in a hansom, driving furiously for the Brixton Road. It was a foggy, cloudy morning, and a dun-coloured veil hung over the house-tops, looking like the reflection of the mud-coloured streets beneath. My companion was in the best of spirits, and prattled away about Cremona fiddles, and the difference between a Stradivarius and an Amati. As for myself, I was silent, for the dull weather and the melancholy business upon which we were engaged, depressed my spirits. “You don't seem to give much thought to the matter in hand,” I said at last, interrupting Holmes' musical disquisition. I had imagined that Sherlock Holmes would at once have hurried into the house and plunged into a study of the mystery. Nothing appeared to be further from his intention. With an air of nonchalance which, under the circumstances, seemed to me to border upon affectation, he lounged up and down the pavement, and gazed vacantly at the ground, the sky, the opposite houses and the line of railings. Having finished his scrutiny, he proceeded slowly down the path, or rather down the fringe of grass which flanked the path, keeping his eyes riveted upon the ground. Twice he stopped, and once I saw him smile, and heard him utter an exclamation of satisfaction. There were many marks of footsteps upon the wet clayey soil, but since the police had been coming and going over it, I was unable to see how my companion could hope to learn anything from it. Still I had had such extraordinary evidence of the quickness of his perceptive faculties, that I had no doubt that he could see a great deal which was hidden from me. Holmes glanced at me and raised his eyebrows sardonically. “With two such men as yourself and Lestrade upon the ground, there will not be much for a third party to find out,” he said. “Then let us go and look at the room.” With which inconsequent remark he strode on into the house, followed by Gregson, whose features expressed his astonishment. A short passage, bare planked and dusty, led to the kitchen and offices. Two doors opened out of it to the left and to the right. One of these had obviously been closed for many weeks. The other belonged to the dining-room, which was the apartment in which the mysterious affair had occurred. Holmes walked in, and I followed him with that subdued feeling at my heart which the presence of death inspires. It was a large square room, looking all the larger from the absence of all furniture. A vulgar flaring paper adorned the walls, but it was blotched in places with mildew, and here and there great strips had become detached and hung down, exposing the yellow plaster beneath. Opposite the door was a showy fireplace, surmounted by a mantelpiece of imitation white marble. On one corner of this was stuck the stump of a red wax candle. The solitary window was so dirty that the light was hazy and uncertain, giving a dull grey tinge to everything, which was intensified by the thick layer of dust which coated the whole apartment. All these details I observed afterwards. At present my attention was centred upon the single grim motionless figure which lay stretched upon the boards, with vacant sightless eyes staring up at the discoloured ceiling. It was that of a man about forty-three or forty-four years of age, middle-sized, broad shouldered, with crisp curling black hair, and a short stubbly beard. He was dressed in a heavy broadcloth frock coat and waistcoat, with light-coloured trousers, and immaculate collar and cuffs. A top hat, well brushed and trim, was placed upon the floor beside him. His hands were clenched and his arms thrown abroad, while his lower limbs were interlocked as though his death struggle had been a grievous one. On his rigid face there stood an expression of horror, and as it seemed to me, of hatred, such as I have never seen upon human features. This malignant and terrible contortion, combined with the low forehead, blunt nose, and prognathous jaw gave the dead man a singularly simious and ape-like appearance, which was increased by his writhing, unnatural posture. I have seen death in many forms, but never has it appeared to me in a more fearsome aspect than in that dark grimy apartment, which looked out upon one of the main arteries of suburban London. As he spoke, his nimble fingers were flying here, there, and everywhere, feeling, pressing, unbuttoning, examining, while his eyes wore the same far-away expression which I have already remarked upon. So swiftly was the examination made, that one would hardly have guessed the minuteness with which it was conducted. Finally, he sniffed the dead man's lips, and then glanced at the soles of his patent leather boots. The little man's eyes sparkled as he spoke, and he was evidently in a state of suppressed exultation at having scored a point against his colleague.